At the Northern edge of the Meadow, where the forest begins, lies our den area. Well-disguised by the trees, it is the safest part of our territory. It is a place for socialization and relaxing. The older fae emerges from her den with a yawn, stretching her long limbs to remove the stiffness caused by sleep. The sun is shining, as it always is in the morning, and beams of light cut through the trees above. Kava takes a deep breath, inhaling the morning air, before lazily heading further from the dens and out into the Meadow's open expanse. A large rock stands not far from the tree line, it's flat surface sun-warmed. The Gatherer climbs up onto it and lays down, looking out over the vast Meadow. A dark coated male stood motionless in the lush grass of the new area he'd discovers. Something about it seemed to beckon him, filling his heart with a sense of belonging. That was something he'd never felt before, which set him on edge, so he continued forward with great caution. Slowly he closed his eyes and raised his nose to the sky, focusing on taking in the scents that surrounded him. Grass, flowers, water, deer...wolves? His eyes re-opened in a flash and the wary feeling in his brain grew. The male had not been around his own kind in almost a year and was completely unsure if he even recalled social customs. However even with these hesitations in his mind, his body continued forward unable to resist the invisible call of the meadow. Though he figured the wolf whom call the area home already knew of his presence, out of respect he still tilted his head back and let out an announcement of his presence. The Gatherer raised her head as the breeze carried a sound across the Meadow. A howl, though Kava didn't recognize it's maker. She stood, and now the wind brought the scent of an unfamiliar wolf, confirming the presence of a stranger in the Meadow. Curiosity filled Kava. It had been some time since the last newcomer to the Meadow. She returned the howl with one of her own, welcoming this wolf, and the Gatherer's dark eyes scanned the grasses stretching out before her, searching for any signs of them. When his call was met with another, Grayson raised his head above the deep grass and followed the sound. He followed the call until he reached the tree line along the edge of the meadow. It looked to be just a cluster of trees and foliage, but the smell of wolf told otherwise, there was den in there somewhere. However the sound he'd heard hadn't come from within, no it was closer. Walking along he treeline, he finally found he source of both the sounds and smells that had called to him. A wise looking female stood above him on an boulder,and the dark brute dipped his head. He assumed she was the proprietor of this territory, but he spoke no words, only stood, motionless, with his head bowed, awaiting her to speak. Kava waited for a long moment, her ears trained for a response, but not receiving one. Just when she was sure the wolf had left, and was about to resume her relxaed position, a dark form appeared in her vision. The old wolf peered at it, trying to perceive what it was. The breeze was bringing the wolf's scent to her more strongly, and Kava knew this figure had to be the wolf she had heard. Kava watched the wolf stop and bow their head, and she regarded them with warm eyes. Or him rather, as it seemed the dark wolf was a brute, with a solid and sturdy frame. "Welcome." She said to the wolf. "What brings you to the Meadow?" He felt her eyes on his figure, but did not dare look up. However when she spoke to him is such a warm voice and welcomed him, he figured she was a kind-hearted wolf. Slowly he sat back on his haunches and raised his head, "Thank you for the welcome madam. My name is Grayson and I am unsure what brings me here." The words the male spoke were the truth, he had no idea what called to him about this place, but something did. His mahogany eyes scanned the area, taking in its beauty before looking back up at the female, "But I feel like I am suppose to be here...If that makes any sense." Laughing slightly, Kava's smile grew wider. "It is nice to meet you Grayson, I am Kava." She said,"And your reason isn't all that strange. The Meadow must have called you, as she calls many." The fae's eyes glanced at the sea of flowers and grass, "Perhaps she thinks you belong here." Slowly, she climbed down from her rock so that she could approach Grayson. "There is a family of wolves that lives on the Meadow, protecting her in exchange for a home. 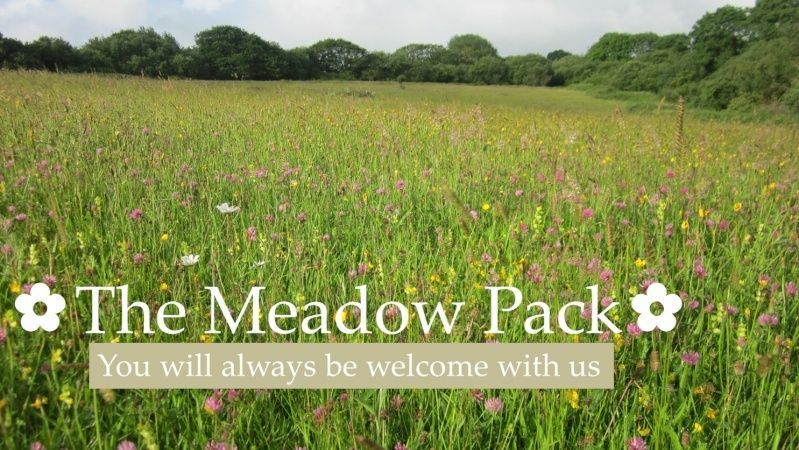 If the Meadow has beckoned you to her and welcomed you, then this family will do the same." The Gatherer laughed again. "Stop me if I'm getting carried away and confusing you." Grayson listened intently, enthralled by the female, known as Kava's, words. He watched her as she climbed down the rocks and moved toward him and laughed softly, telling him to stop if she confused him. However he just shook his head, eyes trained on her and ears focused on every word, "No ma'am, I understand, and I would be honored to join your family and reside within the Meadow." The thought of living with many others of his kind frightened him a bit, for it'd been so long, plus he had always been so socially awkward. Kava had said the family would welcome him as the Meadow had, yet that did not put his fears completely to rest. What if they thought he was weird and wanted him to leave? Never the less he would still try. Kava studied Grayson closely as he spoke of joining the family. The brute looked earnest enough and there was no air of disbelief or mockery about him. Satisfied with his honesty, the Gatherer beamed, overjoyed. "Though I must admit," she began, head turning to look at the tree-shrouded den. Her next laugh sounded a little forced and she grimaced, "The rest of the family is, well, absent. It's just me right now. Or rather," a more peaceful look returned to her face, "just us. It may not be a thrilling life full of adventure, but it is a content and happy one." Flamepelt looked ahead of her, towards a tree-line. She started shakily walking there, thinking of her horrid family, and how she had run from them for almost five days straight. She couldn't wait to get to the tree-line, she was so worn out from running non-stop. She sniffed the air, but she thought her nose wouldn't be able to detect any scents for now, after smelling too many scents on her five-day-long run from her family. She kind of wished she could smell right now; if there was any danger she couldn't scent, she would die instantly trying to battle it, and if she ran, although she had terrific speed, the danger would most likely catch her easily. Flamepelt stopped suddenly, surprised to see the tree-line a few rabbit-hops away. She stepped backwards a few paces, now confused if she should rest here. Then she forgot her fears instantly, and trotted in the forest; she took a deep breath of the fresh, tree-smelling area. She plopped down, and curled up, she lay her head down, and tucked it under her smoke-colored tail tip. Flamepelt sighed heavily, and, with her dusty-colored eyes closed, fell into a deep, dreamless sleep. Kava looked up from Grayson, another new scent filling her nose. No, wait...two new scents. 'How strange,' she mused. 'It is odd for one new wolf to come here, let alone three in such a short time.' She lifted her head and howled, welcoming the two newcomers into the Meadow. One seemed closer than the other, and she set off in their direction, "You are welcome to follow." She told Grayson. It took only a few minutes to reach the first of the two new wolves, a brightly colored young fae found just beyond the treeline, who was sleeping peacefully. "Hello there." She greeted, rousing the fae and giving them a smile. Flamepelt was startled to suddenly see a wolf, she slightly jumped, nervous her family had found her, and calmed down when she saw it wasn't any of her family members. She sighed with relief. Although she knew that this wolf isn't like any of her family members, she bit back saying hello. She just stared at this wolf, staying silent as she could, other than the sound of her breathing. A little confused by the fae's silence, Kava tilted her head to the side and asked, "Are you alright? I hope I haven't frightened you." She kept the smile on her features, trying to show the younger wolf she meant no harm. Flamepelt took a deep breath, and replied quietly "I'm fine. Although you did make me think you were my family...." She shivered crazily when she said the words 'my family'. Then, she stayed totally silent again. Kava smiled even wider, "I can't say I'm from the family that you know, but I can offer you a place in a new family, here on the Meadow." The Gatherer gestured at the expanse of grass behind her, "We would gladly welcome you into our family if you desired a home." Flamepelt said a few words again, starting to think she doesn't need to be that silent around this wolf "Well, you just are lucky you aren't in the family I know, know them or not." She paused, and said "I will also be pleased to be in a new family." A tiny smile went on her face, but quickly disappeared as she thought to herself "Some wolves may not understand me with my...... quietness and...... quiet ways...."
"You are very welcome here!" Kava said, happy to have another wolf join the family. "I am Kava, the Gatherer and leader of this pack, though I will have to save any further explanations for later, as there is another wolf in the area that I must see to." She lifted her head to catch the other newcomer's scent. The wind carried it from the river. Kava turned to walk in that direction, asking the fae, "How about you come with me and tell me your name as we walk?" Flamepelt nodded, and walked after the wolf... Kava, although she didn't say her name just yet. She thought later on in the walk she would say it, but for now, she didn't say what her name is. Accepting that the wolf's silence was going to be a regular thing, Kava set off towards the river. Her limbs ached in protest, not used to doing very much walking, but the thrill of new faces urged her on. The scent of the river grew stronger, as did that of the new wolf, and Kava quickened her pace. Kava hopped back up onto her rock as she arrived at the den site. She sat down, waiting for the two faes to join her. Flamepelt walked up to Kava, and stopped in front of the huge rock, waiting patiently for her to speak. Evie followed the two wolves and stopped in front of the rock as well. "First off, this is our pack's den area, you can claim any free den as your own." Kava gestured with her tail at the cluster of trees behind her. "Second, your ranks and the rules." The guardian's eyes turned towards Evie, "As a hunter, you are responsible not only for bringing back food for the family, but also ensuring that the animal populations remain even here. Do not over hunt a particular creature. As for you," Her gaze slid to the quiet fae, "as a Scout, you will explore beyond the Meadow, watching for threats. 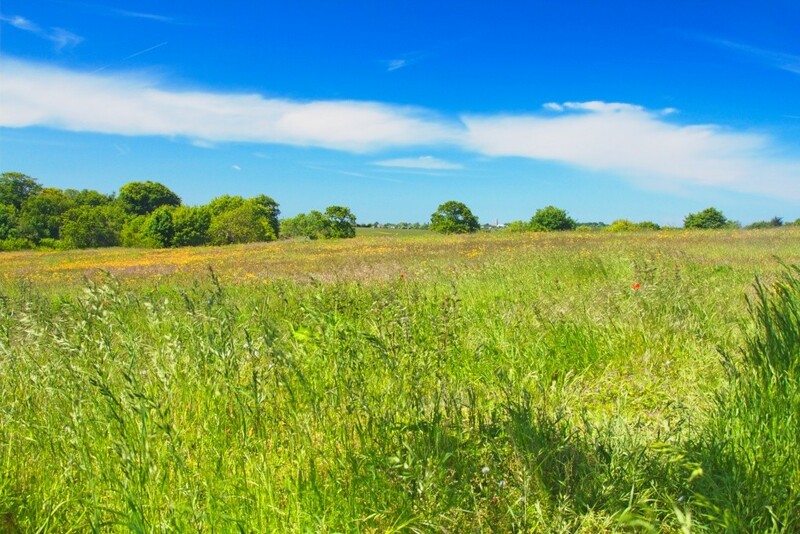 We must ensure that the Meadow remains safe. As for our rules, they are simple. The first is never disrespect the Meadow. She is kind to us and we must be kind in return. The second is respect one another and obey your elders. A family cannot function if it cannot get along." Her gaze hardened, with seriousness, "As the Gatherer, I am the head of this family, so I ask that you heed my words and obey any command I give. This may be quite a lot to take in, but it's all very important. Do you have any questions?"